Welcome to 2016! In this episode, we celebrate the new year and our first anniversary (!) 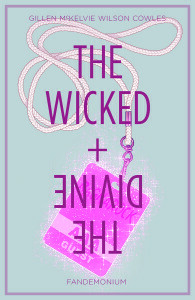 by catching up with what we have been up to since the end of 2015, launching the the first round of Genre Starter Packs, and delving into The Wicked + The Divine Volume 2: Fandemonium. Happy New Year! Read Renay’s review of Fandemonium at Lady Business. Add Fandemonium to your reading list on Goodreads.